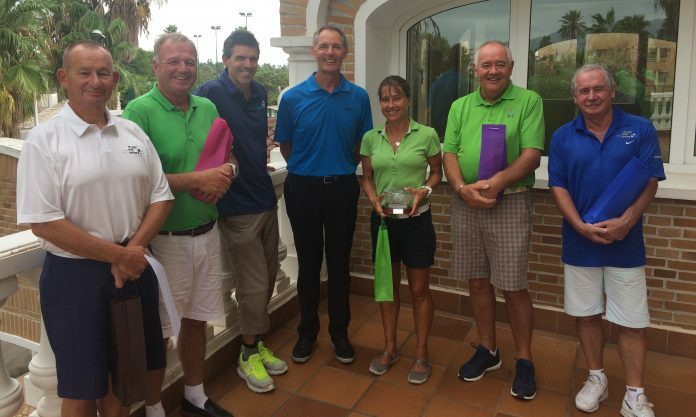 On 1st September Montgo Golf Society played a medal competition at Oliva Nova, kindly sponsored by Oliva Nova professional Paul Tolley. Paul reveled in winding up the members on the driving range before the game, predicting dire weather for the duration of the day, however it was our unfortunate friends from Levante Golf Society who went out before us and endured the worst of the weather. The cooler weather was a welcome relief after the heat and humidity of August, and the worst we had to contend with was a few sharp showers, however whilst the weather improved unfortunately our scoring didn’t. One player however continues to produce exceptional performances, and Sally Cottrell again lead the field home with a fantastic nett 69 off 16.3.The next three prize winners were a distant five shots adrift, with the results determined by countback. In second place was the ever consistent Shaun O’Gorman with a nett 74 off 5.7, pushing John Snelling (9.6) in to third and Ed Wallace (9.8) in to fourth. The fifth and final prize went to George Braddick with a nett 75 off 14. The unfortunate Geoff Willcock took Paul’s special prize for the worst nett score of the day, however he must have hit at least one good shot as he also took the prize for nearest the pin on the 3rd. Peter Twine completed the winning group by taking the nearest the pin on the 16th, and with no 2’s recorded the stock of Montgo balls remained undamaged. Sally’s incredible form over the past six weeks has seen her reduce her handicap from 19.8 to 15.4, winning no less than three trophy competitions in the process. If she carries on like this we might as well move the societies trophy cabinet to the Cottrell household for the rest of 2017 but as the Captain pointed out to the membership afterwards, if you are not happy about Sally winning everything, get better!!! La Finca Golf Society week ending 13th October.